Related link Deptford Library Website. 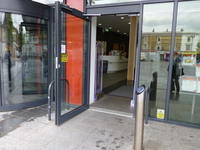 Deptford Lounge is part of the new complex built in the heart of Deptford with Tidemill School. 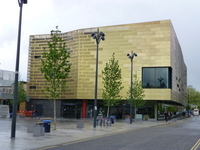 The community venue hosts a range of cultural, leisure and community services, some of which are shared with the school and are available to the public out of school hours. 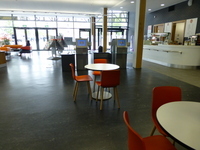 Ground Floor: reception, library, PC and MAC computer suites, meeting rooms, public toilets including accessible toilets, changing place, baby change. First Floor: a hall, studio, music room, food science room, terrace room with deck, general meeting rooms, accessible and standard toilets. 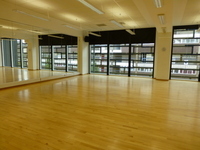 Second Floor: an outdoor ball court, toilets and changing facilities, community offices. Third floor: community offices and staff areas. 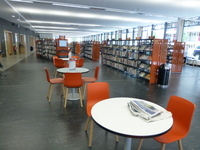 The Lounge and Library have a regular programme of activities, classes and events - see the websites for details - and the facilities are also available to hire by outside groups. 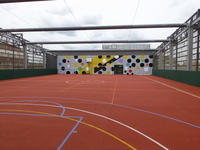 The pictures show the rooftop ball court and the dance studio. The Lounge is closed on bank holidays.. The nearest mainline station is Deptford. The nearest underground station is Deptford Bridge DLR. The dimensions of the marked Blue Badge bays are 300cm x 400cm (9ft 10in x 13ft 1in). 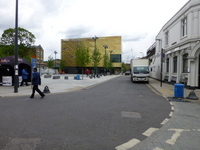 On street Blue Badge parking is located Tidemill Way, at the rear of the venue. The Blue Badge bays are approximately 100m from the accessible entrance. At the time of our visit, the signage to the Blue Badge bays had been covered by contractors and the bays were being used by non-Blue Badge holders. This information is for the entrance located at the front of the venue, on Giffin Square. The door opening is 101cm (3ft 4in) wide. The powered door is operated by a push pad. The push pad is within reach for wheelchair users. 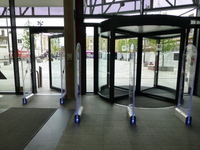 You are on Outside Access (Revolving Doors). Skip to the next section. 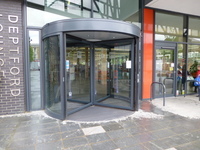 This information is for the entrance located to the left of the accessible entrance. The revolving doors are Manual. You are on Reception (Lounge and Library Reception). Skip to the next section. 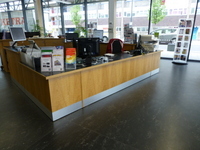 The reception desk is 10m (32ft 10in) from the accessible entrance. A hearing assistance system is available in meeting rooms 1-7. 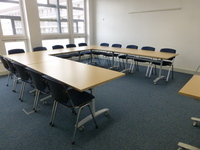 The pictures show the general circulation area on the ground floor and one of the first floor meeting rooms. You are on Other Floors (East Stairs). Skip to the next section. There are 30+ steps between floors. 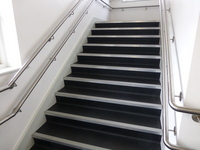 These stairs are at the east end of the building, off the lobby at the far end of the library space. You are on Lift (East Lift). Skip to the next section. The lift is located in the lobby at the far end of the library. The lift is 40m (44yd) from accessible entrance. 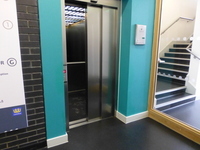 The lift, along with the stairs and all the upper floors, is in an area which requires an access pass. The pass is available from staff to those hiring space or attending meetings on the upper floors. 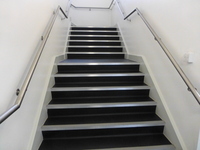 You are on Other Floors (West (School) Stairs). Skip to the next section. These stairs are in an area which requires an access pass. You are on Lift (West (School) Lift). Skip to the next section. 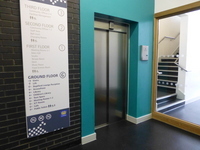 The lift is located in the lobby near the accessible entrance. 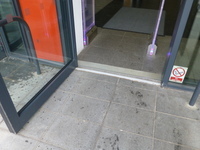 The lift is 15m (16yd) from accessible entrance. The dimensions of the lift are 140cm x 205cm (4ft 7in x 6ft 9in). 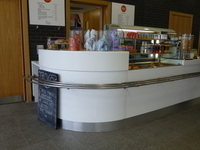 The nearest table is 10m (10yd 2ft) from the accessible entrance. 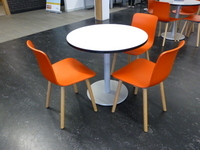 The café can also provide catering for meeting/ training rooms. 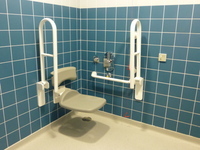 The facilities available in the accessible shower are handrails and a flip down seat. 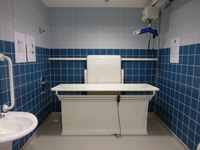 The accessible shower is located on the second floor, 10m from the west lift. There is level access from this area to the outdoor (rooftop) ball court. 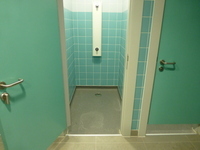 There are standard showers within the male and female changing rooms on the second floor. The changing rooms are 15m from the west lift and 10m from the ball court. There is level access to the ball court from the changing facilities. 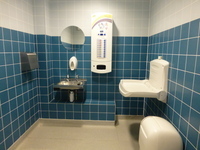 The facility is located on the ground floor, next to the standard toilets. 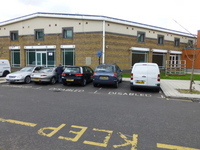 The facility is 15m (16yd) from the accessible entrance. The key can be obtained from staff at reception. The dimensions of the facility are 240cm x 430cm (7ft 10in x 14ft 1in). The transfer space on the left as you face the toilet is 77cm (2ft 6in). The transfer space on the right as you face the toilet is 300cm (9ft 10in). The changing bench is height adjustable by electric motor. There is also a shower head which sprays onto the changing bench. The shower head is not adjustable. You are on Accessible Toilet (First Floor East). Skip to the next section. 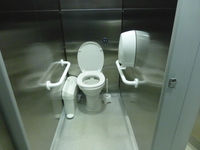 The accessible toilet is 10m (32ft 10in) from the lift. The accessible toilet is located off the stair lobby at the east end (rear)of the building. 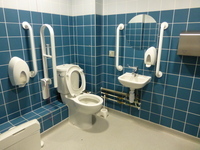 The dimensions of the accessible toilet are 190cm x 210cm (6ft 3in x 6ft 11in). The picture on the left shows the toilet described. 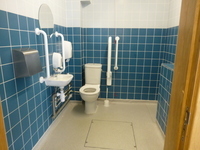 There are additional accessible toilets at First Floor West, Second Floor East & West. 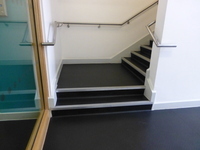 The childrens' toilet on the ground floor, directly off the library space, is also accessible(pictured right). The female and male toilets are located on the ground floor, next to the cafe. The female and male toilets are 15m (16yd) from the accessible entrance. Baby change facilities are located in the baby change room, next to the cafe. 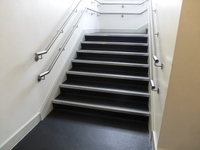 There are additional standard toilets at both ends of each of the upper floors.